Testing is a complex, challenging phase of software development. Because of this, many organizations struggle to plan their testing needs and often underestimate the effort. This paper discusses our predictive approach to test planning that helps to ensure high quality, lower cost, and improved schedule, while reducing risk. The predictive approach estimates the actual number of defects that should be discovered in a particular test phase. Based upon this information, an organization can plan the number of test cases and testers that are needed to successfully accomplish the test objectives. In addition to assisting in test planning, the predictive approach can help manage the entire testing process by comparing actuals to the prediction at any point in time. 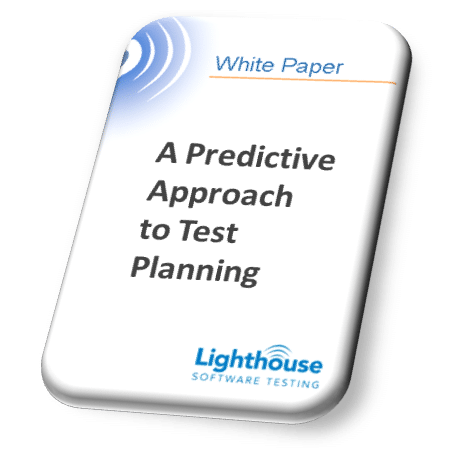 Fill out the form to get your FREE copy of our White Paper: A Predictive Approach to Test Planning.